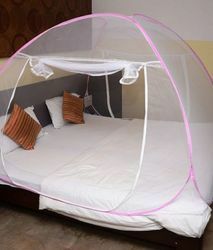 We offer mosquito net which are designed as per the styles of tent designed. We offer cotton mosquito nets, polyester mosquito nets, nylon mosquito nets and canopy mosquito nets. Canopy mosquito nets offered by us are made of polyester (75 denier, mesh 156) and are offered in circular shapes. The stainless ring is fold-able (these pop-up when using), which makes these canopy mosquito nets light weight as well as very easy to pack in a small nylon bag. Mosquito Nets offered by us are made by nylon, polyester, cotton and available in square, round or other shapes as desired by the clients. We can offer these tents in denier 75,100 mesh 156,196 finishes. Looking for Mosquito Net ?